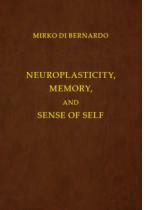 Title: Neuroplasticity, Memory, and Sense of Self, An Epistemological Approach Author: Mirko Di Bernardo Imprint: The Davies Group, Publishers soft cover 286 pp. USD 28.00 ISBN 9781934542415 2014 Neuroplasticity, Memory, and Sense of Self offers a proposal for overcoming the centuries-old divide between the human sciences and the exact sciences through recourse to an epistemological framework able to bring about a fruitful dialogue between scientific experimentation (methodological reductionism) and lived experience linked to the universe of meaning (holistic dimension). The author’s approach focuses on cutting-edge issues relating to the close relationship that exists between cognition and life, such as synaptic plasticity, which is the basis of memory and cognition, the relationship—at the level of the higher cognitive activity proper to human beings—between perception, thought and sense of self and the nature of intentionality, the difference between consciousness and self-consciousness, and the genesis of meaning in the context of deep processes of self-organization in order to elaborate a new epistemological approach to the mind/body problem and a new model for the process of construction of knowledge. Contents Preface, Ignazio Licata Chapter 1 Neurophysiological Aspects of Consciousness 1.1 Premise 1.2 Memory and the neurosciences 1.3 Clinical aspects of consciousness 1.4 The vegetative state 1.5 The minimally conscious state 1.6 Functional diagnosis of state of consciousness Chapter 2 Molecular Mechanisms of Memory 2.1 From memory as a psychological process to the biological revolution 2.2 Synaptic plasticity and non-declarative memory 2.3 The molecular biology of short-term and long-term memory 2.4 Declarative memory and brain systems 2.5 Long-term potentiation and the consolidation switch Chapter 3 Self-consciousness and Causality 3.1 The “nature” of consciousness and neurobiological explorations 3.2 The two faces of computationalism: symbolic and sub-symbolic systems. 3.3 Complex systems and biological information 3.4 The pre-conditions of ethics 3.5 Awareness, self-organization and intentionality 3.6 Memory, visual cognition and meaningful complexity Chapter 4 Sense of Self: A Non-standard Approach 4.1 Interpersonal connections, self-regulation and integration 4.2 Mirror neurons and empathy 4.3 Pedagogy between bio-neural sciences and philosophy 4.4 Functional realism and knowledge construction Notes Works cited About the Author Mirko Di Bernardo (PhD, University of Rome “Tor Vergata”) is currently fellow of the Advanced School for Interdisciplinary Research at the Pontifical University of the Holy Cross and postdoctoral researcher and adjunct professor of Philosophy of Science at the University of Rome “Tor Vergata”. His principal fields of interest are: Epistemology, Cognitive Science, Complexity Theory, Self-Organisation Theory and Bioethics.